The group says women pastors go against its beliefs, according to its interpretation of the New Testament. The magazine was taken off stands in more than 100 Lifeway Christian Bookstores across the country, including six in metro Atlanta. Southern Baptist politely says that’s a role reserved for men. Published for nearly 20 years, Gospel Today is the largest and most widely distributed urban Christian publication in the country, with a circulation of 240,000. 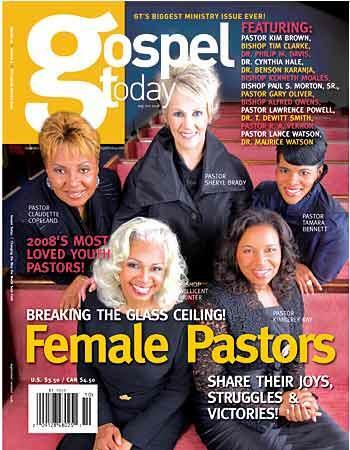 The magazine's publisher, Teresa Hairston, said she was just reporting on a trend, not trying to promote women pastors. Nationally, the Southern Baptists have adopted statements discouraging women from being pastors, but their 42,000 U.S. churches are independent and a few have selected women to lead their congregations. The faith was organized in 1845 in Augusta, Ga.
Chris Turner, a spokesman for Lifeway Resources, said the cover was not the reason the magazine was pulled from Lifeway's shelves. Featured on the cover are Pastor Sheryl Brady of The River in Durham, N.C.; Pastor Tamara Bennett of This Is Pentecost Ministries in Sacramento, Calif.; Bishop Millicent Hunter of The Baptist Worship Center in Philadelphia, Pa.; Pastor Claudette Copeland of New Creation Christian Fellowship in San Antonio, Texas; and Pastor Kimberly Ray of Church on the Rock in Matteson, Ill.
Bennett said she is encouraging people to ask for the magazine.